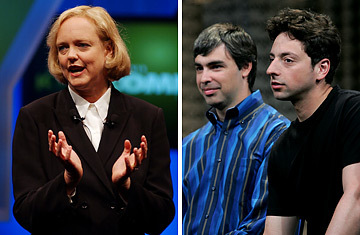 EBay is going gaga over Google. Less than a year after the two Web giants signed a billion-dollar advertising pact proclaiming a passionate partnership, a lovers' quarrel has broken out. Ebay, Google's top advertiser, pulled its ads from the search giant's site after Google announced that it would hold a party Thursday night in Boston, where eBay had planned activities that evening as part of its Live! 2007 conference, a gathering of the auction site's devotees. The planned Google celebration devolved into a Boston tea party of sorts, with eBay dropping Google ads in protest of the search engine's party poaching. Google then backed off, canceling its shindig. EBay played it cool, announcing that its ad purchases were halted as part of a routine test of marketing options. Cynics responded that anyone who bought that claim should check to see if eBay might be auctioning off a bridge in Brooklyn. The spat reflects growing tensions between the search and auction giants as each races onto the other's turf. Over the past year Google has ramped up Checkout, its online payment tool that competes with eBay'sPayPal, and eBay recently launched an auction marketplace for TV and radio ads aimed at media ad markets that Google is also targeting. But eBay's retaliatory measure has proven surprisingly revealing. It turns out that eBay can generate a lot of traffic from Google even without bothering to advertise. A quarter of the search traffic Google sends to eBay comes from people typing in terms like "ebay.com" into Google's search box, rather than from ads paid for by eBay, according to research firm Hitwise. And given that Google's ad policy prevents it from placing rivals' ads when users type in "eBay," the auction site gets a decent showing on Google even without paying for it and without rivals' ads cluttering up searches for the auction site. "Maybe eBay will realize that its organic traffic from Google is enough," says Bill Tancer, Global Research Manager for Hitwise, referring to simple searches that lead to eBay, as opposed to paid ad links. The tiff with eBay is just the latest in a series of skirmishes occupying Google's senior brass. The Mountain View, Calif.,-based company faces an ongoing billion-dollar suit from Viacom against YouTube, which it bought in 2006. And Google's lawyers are also taking on Microsoft, having filed an antitrust complaint over the way Bill Gates and Co. allegedly hamper competitors' desktop searches. On the consumer front, Google has recently faced a surge of criticism over its privacy policies. Privacy International, a U.K.-based civil liberties group, gives the portal poor marks in a new report, calling Google the new Microsoft because the portal now yields so much power. And after Google Maps introduced street-level images recently, critics complained bitterly about the company's roving cameras. But even as eBay joins the list of Google's agitators, the search giant continues to soar, having recently overtaken Cisco Systems, albeit briefly, as Silicon Valley's most valuable company, with a market cap approaching $160 billion. And its battles don't seem to affect Google's broader reputation: In a recent survey by research firm Universum, 5,500 MBA graduates ranked Google the most attractive of all companies to work for this year.